Speck, a 9 month old male neutered kitten, presented to Oswego Animal Hospital for vomiting. The owners noted in the last 24 hours, Speck had been vomiting repeatedly, which was very unusual. Speck otherwise seemed to be eating and drinking normally, and was still a playful kitten. Abdominal radiographs were taken due to concern for his frequent vomiting. As pictured, inside of Speck there is a large radio-opaque object (meaning the object shows up bright white on the radiographs) trapped in the small intestines. This is consistent with a metallic foreign body. All of Speck’s vitals were fortunately normal during presentation and the intestinal foreign body could be felt on examination in the mid abdomen. 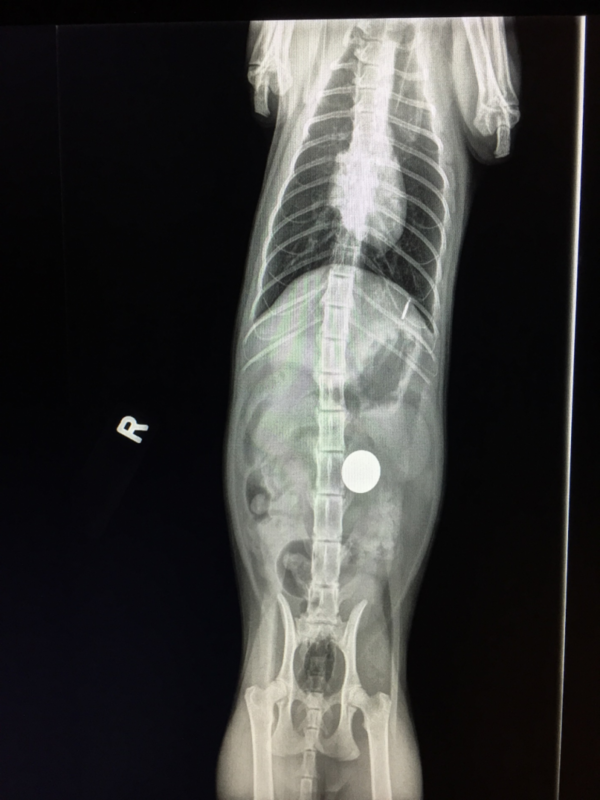 The radiographic findings of a foreign body with secondary distention of the small intestines and stomach is consistent with an obstructive foreign body and Speck was taken to surgery. During surgery, the foreign body was found stuck in the duodenum (the first part of the intestines) and was removed through a procedure called an enterotomy. 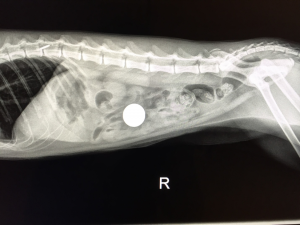 As the object was removed, it was discovered to be a penny! During and after surgery, Speck was placed on antibiotics and pain medications. Speck made a swift improvement after the surgery, and was discharged to his owners the following day where he made a full recovery without complications. This case has several important highlights that resulted in a favorable outcome. First, the owners sought prompt veterinary care after they noticed Speck was unwell. All foreign bodies are best addressed as soon as an ingestion is known or clinical signs emerge. Failure to treat a foreign body quickly can result in severe damage to the gastro-intestinal system resulting in leaks, infection, and in some cases tissue death that requires more aggressive surgical repair and even removal of part of the intestines. A second interesting part of this case was specific to the penny itself. Pennies produced after 1983 contain the metal zinc. Zinc from pennies can be a source of life threatening toxicity if ingested as they can cause a hemolytic anemia, which causes breakdown of the red blood cells. Fortunately for Speck his penny was produced in 1972, meaning it is copper based and will not cause any toxicity–in this regard, it may have been a lucky penny after all!